The Mall of America (MOA) is just one of several travel treasures to explore when visiting Bloomington, MN. Along with many exciting activities at the Mall, venturing out on a bike can an make it easy to see more south metro attractions. With designated bike routes and commuter paths along the area streets, it’s easy to spend several days seeing the sights. Bicycling to MOA from American Boulevard. When visiting Bloomington, the MOA makes an excellent multi-modal gathering point to see all the treasures here. 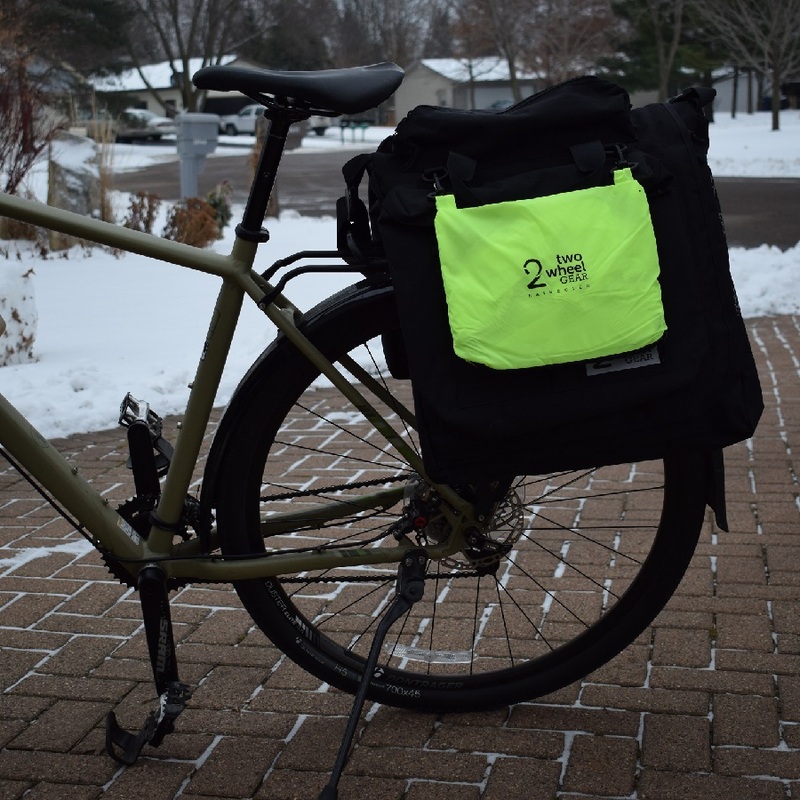 By starting at the MOA’s north parking lot and pedaling east, it is less than a mile and a half to the Minnesota Valley National Wildlife Center. Along the way, you can stop by the Northwest Airlines Museum to learn more about Minnesota’s aeronautical history. 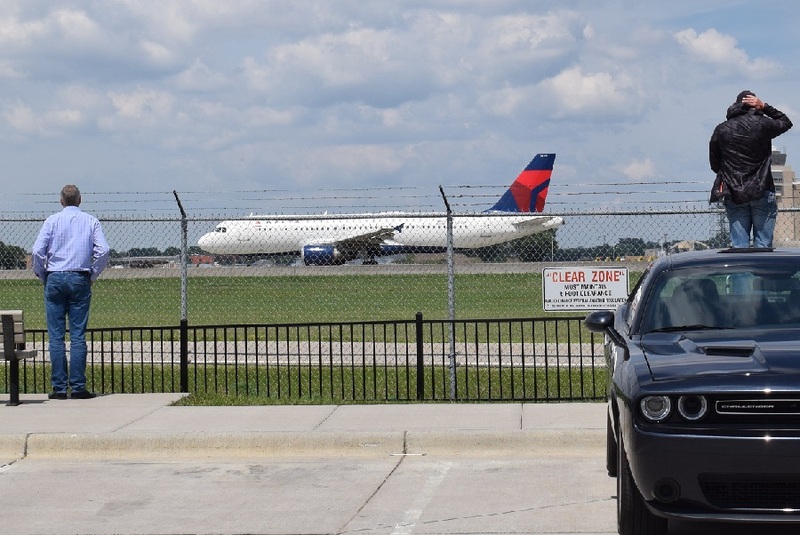 If you like watching big planes land and takeoff it is fun to take the northern bike route to the viewing station at the Minneapolis-St. Paul International Airport. To the west, less than five miles, saddle up the family for a days adventure at the Works Museum. To the south along the Minnesota River Valley mountain bikers and hikers alike will find hours of fun. On the north side, one of many bike parking racks at the Mall of America. A revolutionary place for shopping, entertainment, and attractions, John Emerson says it best, “I like using the MOA as a meeting point when biking around the south metro. It’s nice, and I can come a little early or stay after a bike ride and get some shopping in, or grab a bite to eat. 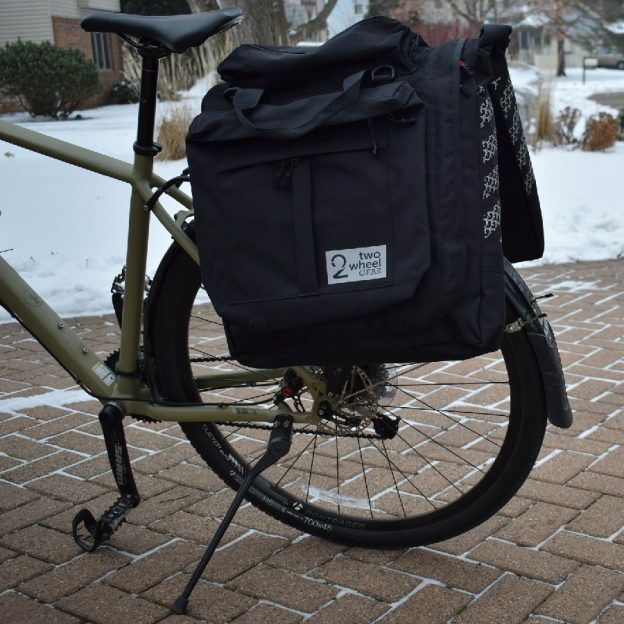 Plus, getting to and from the Mall is easy with the bike-friendly sidewalks, access to light-rail and ample bike parking.” We agree with John, and the Mall makes the perfect multi-modal commuting hub to explore Bloomington on two-wheels. From the Mall of America’s north parking lot, the sidewalk/trail running parallel to American Boulevard works well as a bike commuter route along the 494 Freeway strip. Once at the Mall you will find bike racks near most of the main entrances and lockers inside for changing clothes. If you are coming in by Metro Transit (bus or light rail), use the lower ramp on the east side. 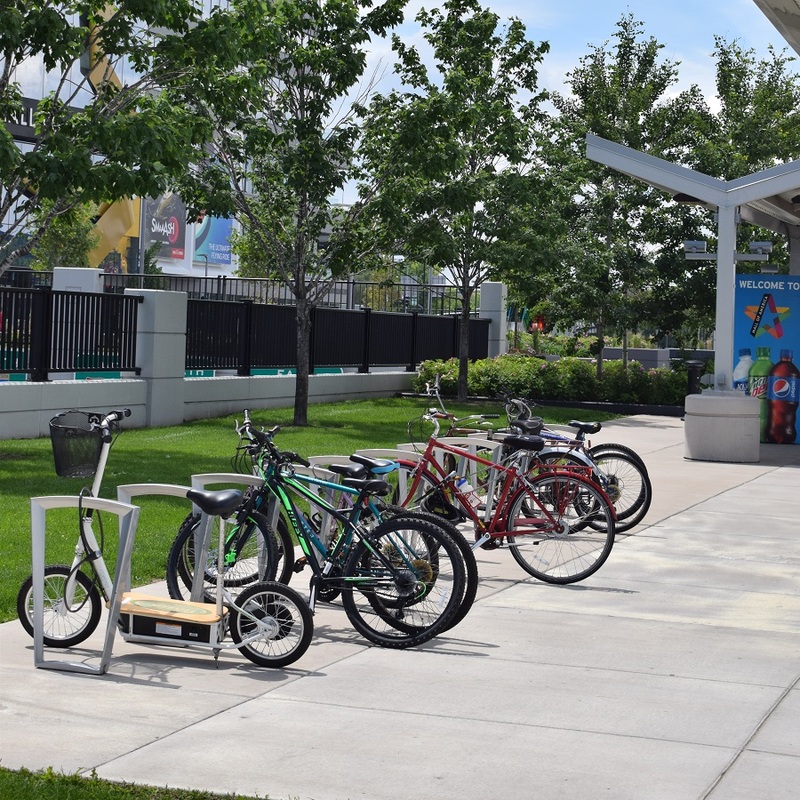 There are plenty of bike racks next to the bus station to secure your bicycle. For more information see MOA services and map. Riding east from the Mall, a tour rider can stop at the Crowne Plaza Hotel where the NW Airline Museum is located. One of the many displays at the Northwest Airline Museum. Located one mile east of the Mall of America the Northwest Airlines History Center Museum is worth checking out. Here you will find Minnesota’s home-town airline of the past. Visiting you will see over 4,000 aviation artifacts, from 1926 to 1998, to sift through. Plus, a gallery of photos hanging in the hotel hallways to enjoy as you make your way to the museum. It is easy to spend a couple of hours looking at the various collection here! According to the Minnesota Historical Society’s review, you will find records on air routes, aircraft accidents, hijackings and more. Also, see information and video on Northwest’s involvement in World War II. In the airlines, correspondents section discover communications with aircraft manufacturers and aviators like Amelia Earhart. There are also newspaper accounts of the 1989 takeover of NWA Inc. and the company’s brush with bankruptcy. To find the museum in the Crowne Plaza Aire MSP Hotel, at Two Appletree Square, take the elevator in the lobby to the 3rd Floor. As you make your way to the museum, enjoy the photos along the hallway. 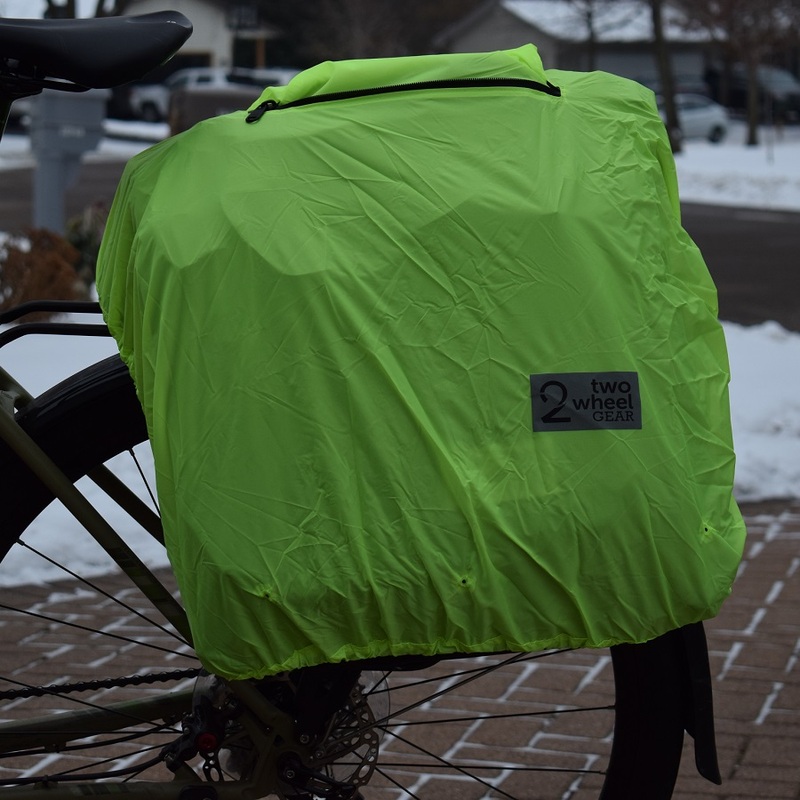 If the weather isn’t conducive for bicycling to the museum consider using the light-rail from the Mall of America. The Hotel is across the street from the 34th Avenue Blue-line station. The Minnesota Valley National Wildlife Refuge and Visitors Center are overlooking the river and wetlands below. 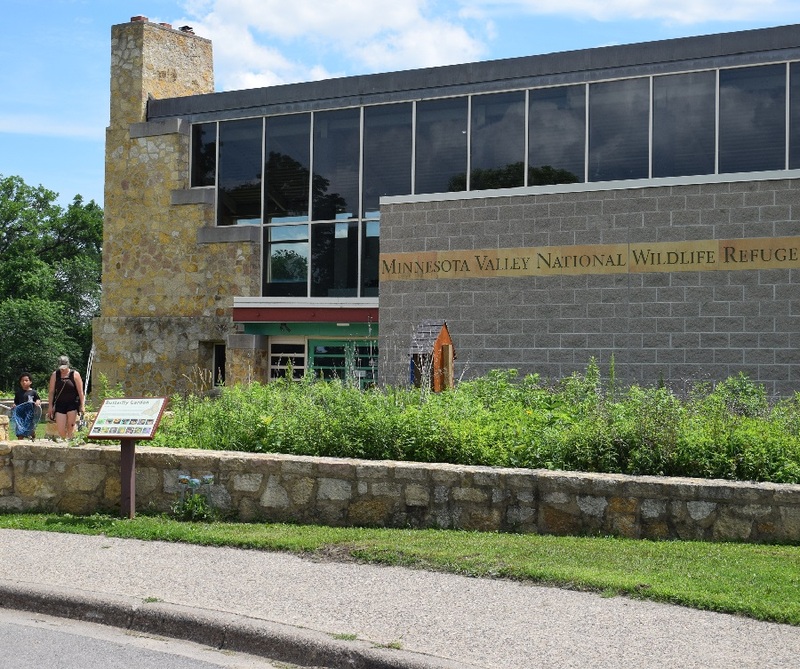 A short distance east of the airline museum and across from the Hilton Hotel is the Minnesota Valley National Wildlife Refuge and Visitors Center. Its grand stature overlooking the river valley below offers a castle-like presence. Inside it feels more significant than the average visitors center, and it is. 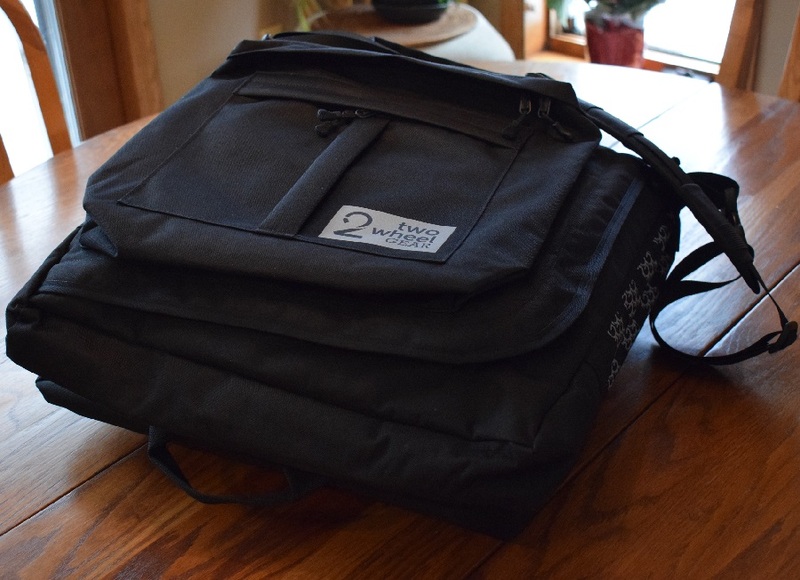 It has everything including information on the wildlife that calls the refuge home. In the theater and interactive exhibits, kids of all ages can learn about the wonders of the natural world. There are also several large murals that are made out of tiny pictures of animals that can be found inside. Step outdoors, right behind the center you will find a stone observation deck with two telescopes. Here it’s easy to focus on flora and fauna across the river valley while relaxing in centers natural surroundings. If you are up for a walk and want to get close to nature, take a hike on one of the well-managed trails in the refuge. Walk at your own pace and stop periodically to reflect on the serenity of nature. As you explore some of Minnesota’s environment, you will find sitting areas scattered along the path to pause and reflect. At some point, if you walk far enough, you’ll connect to a dirt road known as the Long Meadow Trail. 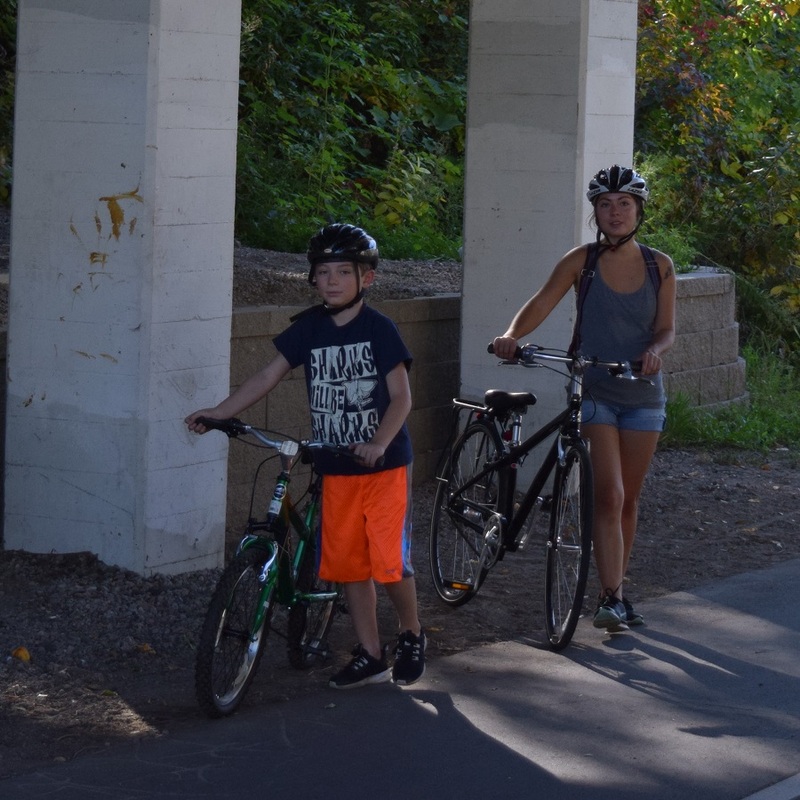 This multi-use trail takes you up the river valley to the old Cedar Bridge and beyond. Along the path you will pass by fields that grow long grass; trees that now and then shelter you from the blazing sun; waterfowl floating in the wetlands; and a bridge that takes you over the Minnesota River. If you’re lucky enough you might even pass by an artist seeking inspiration from what’s around them and putting it on canvas. With free admission to get into these two attractions, getting there by bicycle can add to the fun and memories. First, look at the map on pages 40-41 of the 2018 Minnesota Bike/Hike Guide. Then copy the turn-by-turn Q-sheet for your next bike adventure to the NWA Museum and Minnesota Valley National Wildlife Center. 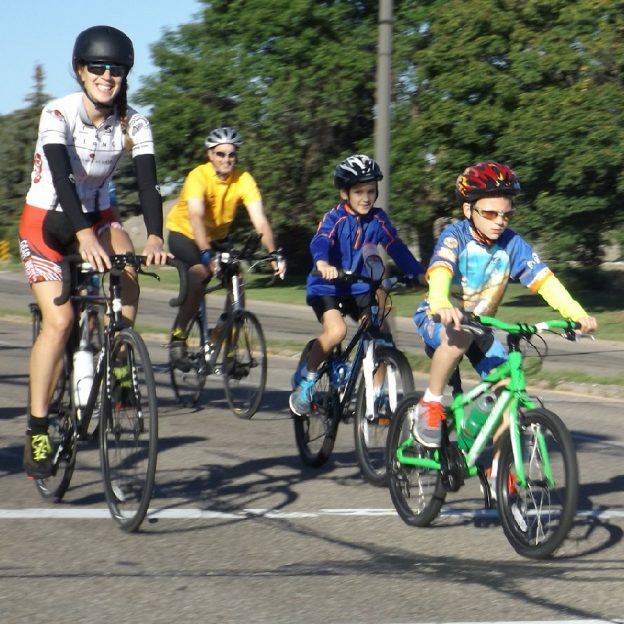 If a Viking scrimmage is of interest, continue riding east See information here on bicycling to the new Vikings Training Camp for a game this summer. Plenty of bike parking is available at the Works Museum. A five-mile bike ride west of the Mall of America, in Bloomington, brings you and your kids to the Works Museum for some mind-expanding fun. In the interactive Experience Gallery, your family can experiment with simple machines, structures, and shapes that have sensors and imaging and optical technologies. Your kids can touch, try and build as they explore how things work. The Workshop in the museum is a new creative space for families. This space is perfect for the youngsters in your home. Especially for those who like to sew, build things, or create art — the ideal place for a bonding exercise with your child. In the art department classes will help you and your child produce a stop-motion animation video together. Another level allows you to create your own LED sign and there are many more classes to select. The Works Museum is located at 9740 Grand Ave S, Bloomington, MN 55420. 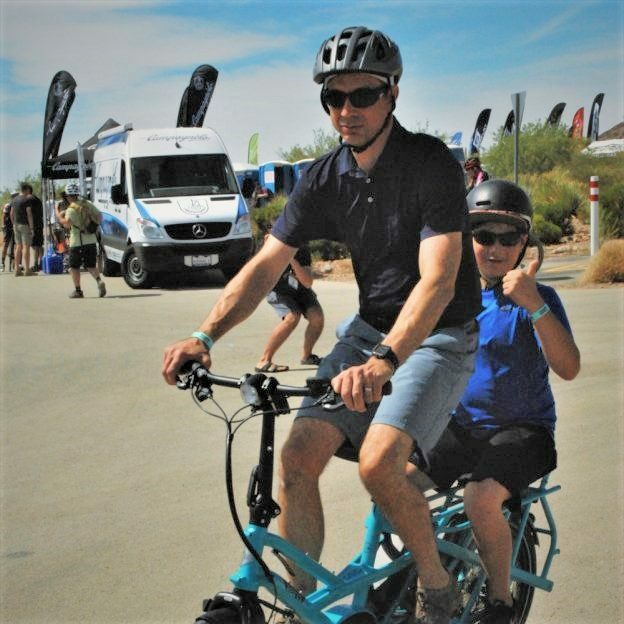 Getting to the Works Museum by bicycle can add to the fun and memories when visiting with the family. First, look at the map on pages 40-41 of the 2018 Minnesota Bike/Hike Guide. Then copy the turn-by-turn Q-sheet for your next bike adventure to this museum. Please note – the following route offers a combination of roads with parallel bike/walk paths and quiet neighborhood streets. The MSP Observation Area for those wishing to watch the big planes land and take off. 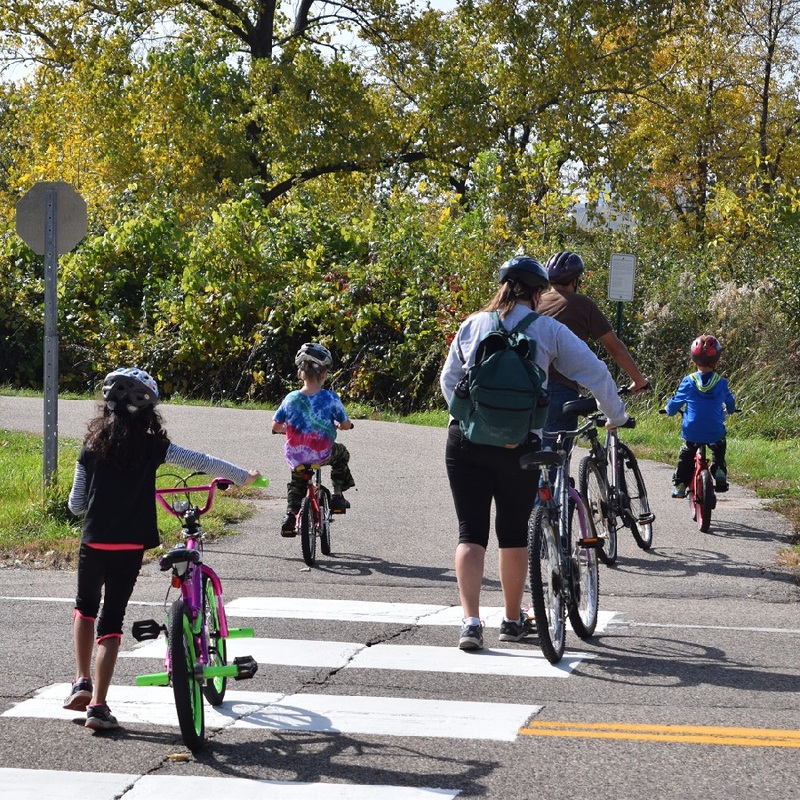 Another fun opportunity to ride your bike from the Mall of America includes a visit to the Minneapolis/St. Paul International Airport Viewing Station. From the MOA to the MSP Aircraft Viewing Station! 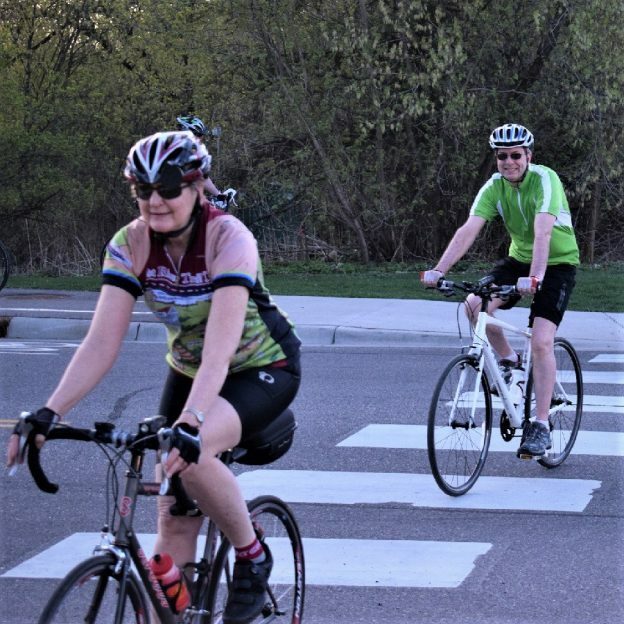 Check here for more fun activities, attractions and hotels to bike to when staying or visiting Bloomington, MN. 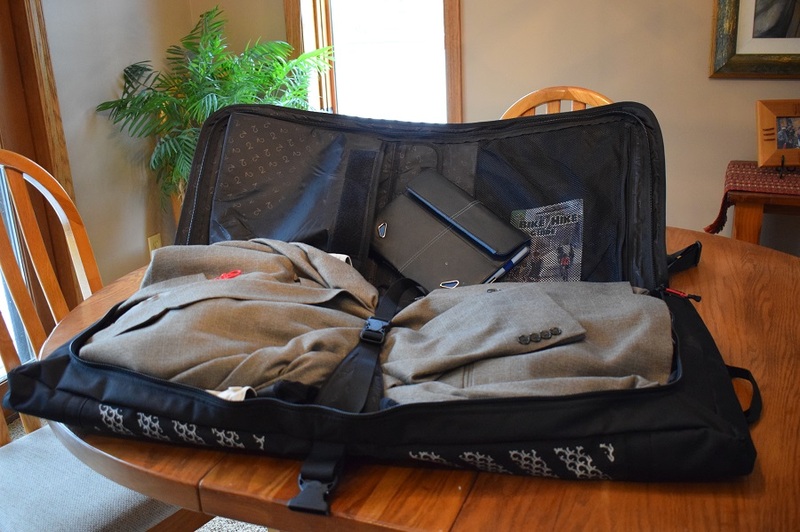 This entry was posted in Destinations, News and tagged #moa, Blooming bike map, Bloomington attractions, Bloomington MN, Mall of America, Minnesota Valley National Wildlife Refuge and Visitors Center, MSP airport viewing station, multi modal commuting, Northwest Airline Museum, the Works Museum, Twin Cities Orthopedics Performance Center on August 25, 2018 by Russ Lowthian. Biking to the new Vikings Training Camp, from the Mall of America (MOA) in Bloomington, MN can add to the fun when taking in a scrimmage game. With the recent announcement of the training camp’s schedule, the maps in the Minnesota Bike/Hike Guide can help make it easy get to a game. Less of a hassle factor – starting at the MOA is the perfect place to meet friends staying at area hotels and bicycling together to a game. A cyclist riding his fat bike across the 494 bike/pedestrian bridge over the Minnesota River toward Eagan. Going to an area attraction like the Vikings Training Camp, the Mall is an excellent multi modal gathering point to get there. Biking from the north parking lot at the MOA it is less than seven miles to the new Vikings facility. Along the way make time stop by the Northwest Airlines Museum or Minnesota Valley National Wildlife Center. Getting to the attractions on a bicycle can be fun and add to the memories. 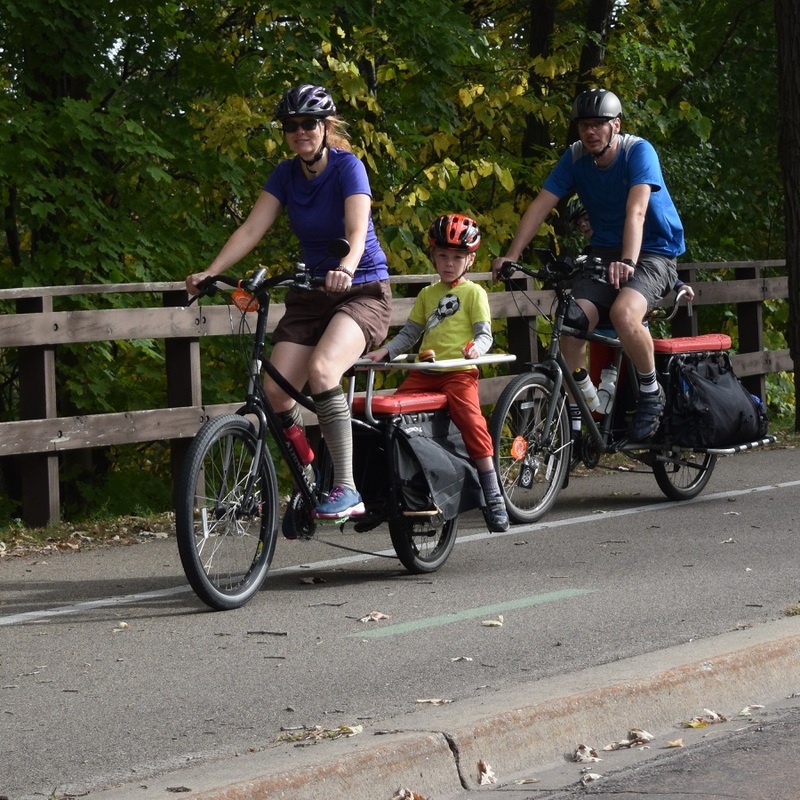 To plan your next visit to one of Bloomington’s Attractions look at the maps on pages 40-41 and 52-53 of the 2018 Minnesota Bike/Hike Guide. 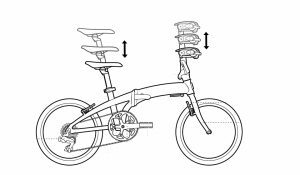 For a trip to the Vikings camp copy the turn-by-turn Q-sheet below for your next bike adventure. From the MOA Entrance on the north side! 0.0 Cross the north MOA parking lot. 0.2 Right on East American Blvd (side walk trail or street). 1.1 Cross 34th Ave. NW Airlines Museum/Crown Plaza Hotel (SE corner). 1.3 Entrance to the MN Valley Wildlife Center. 1.6 Onto bike trails over Minnesota River. 3.9 Right on trail along Pilot Knob Rd. 4.1 Left onto Corporate Center Ln. 4.4 Left onto Trapp Rd. 5.1 Right on Hwy 55 10 foot shoulder. 5.4 Left on Blue Gentian Rd. 6.2 Cross Dodd Rd/149 onto Vikings Pkwy. 6.3 Left at Round-a-bout onto Lone Oak Pkwy. 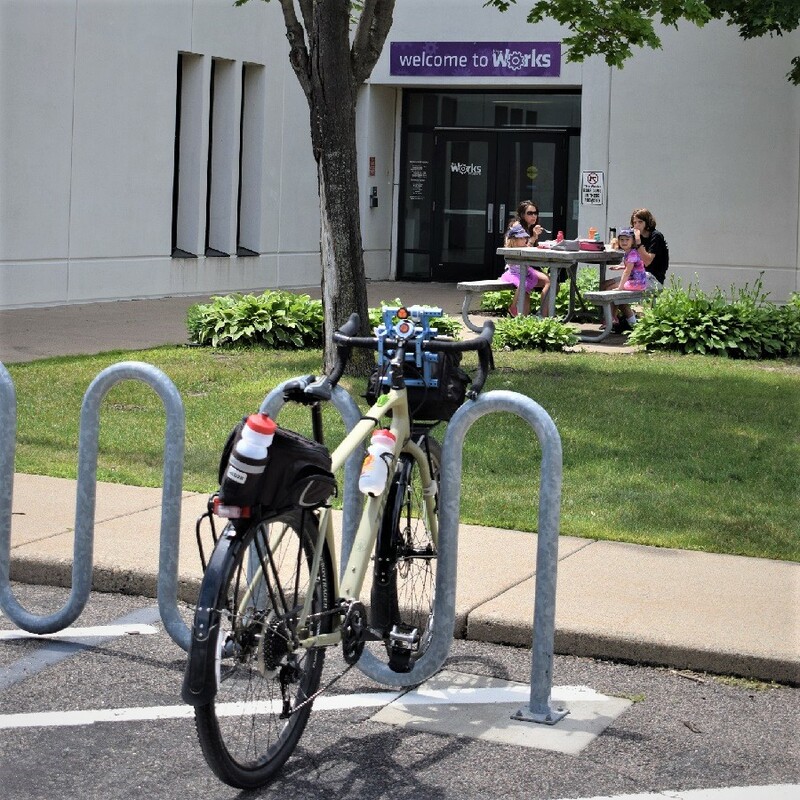 6.4 Right on O’Nell Dr.
6.8 North entrance to Vikings Training Camp (Valet gate) and bike racks are available at main entrance inside to secure your bike. A revolutionary place for shopping, entertainment and attractions, John Emerson says, “I like using the MOA as a meeting point when biking around the south metro. It’s nice, I can come a little early or stay after a bike ride and get some shopping in or grab a bite to eat. 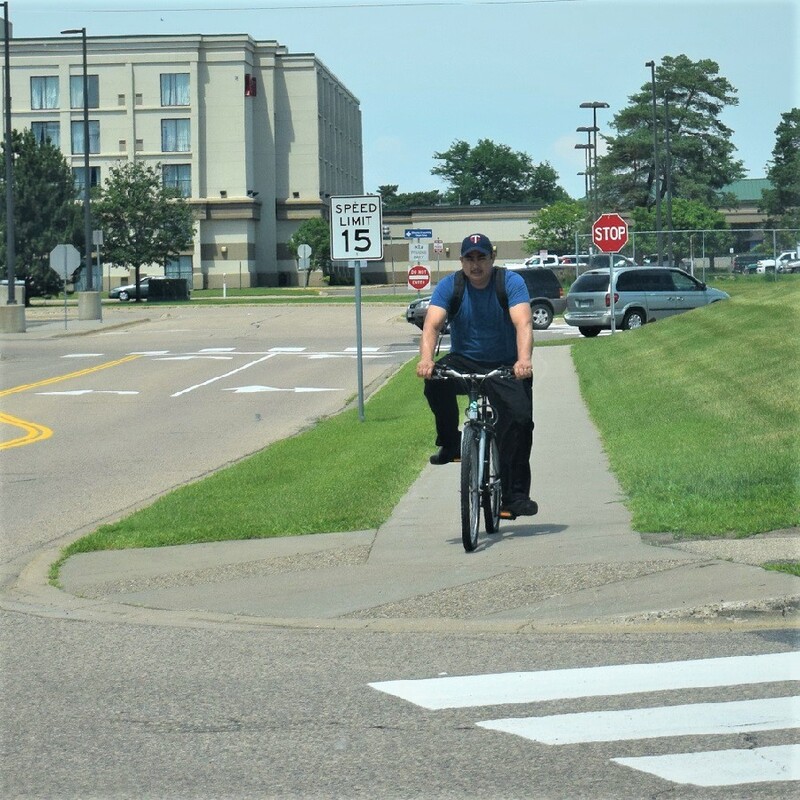 Plus, getting to and from the Mall is easy with the bike friendly sidewalks, access to light-rail and ample parking.” We agree with John. 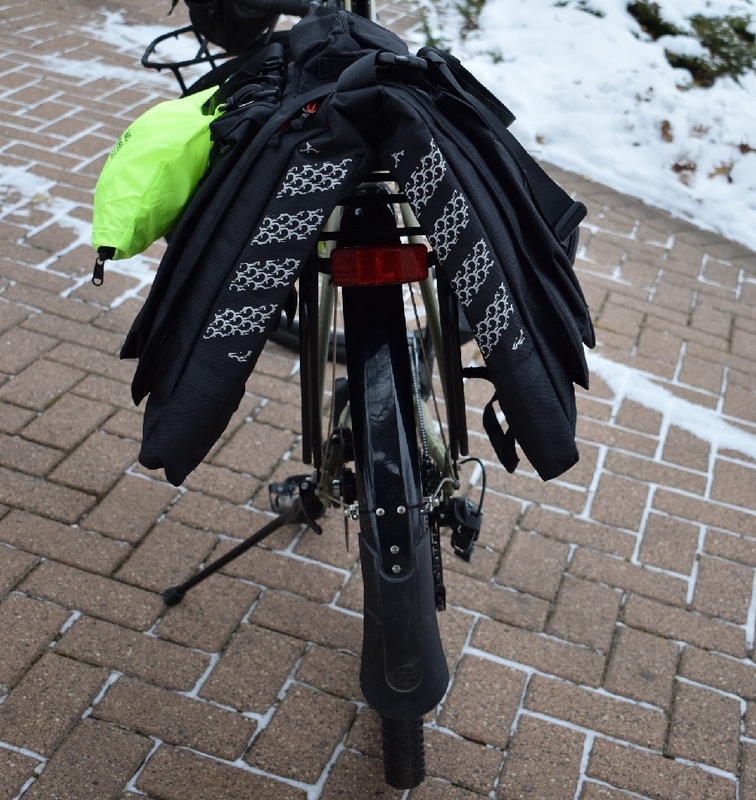 The MOA makes a perfect multi modal commuting hub where travel treasures can be exploredvon two-wheels in Bloomington. One of many bike parking racks at the Mall of America. 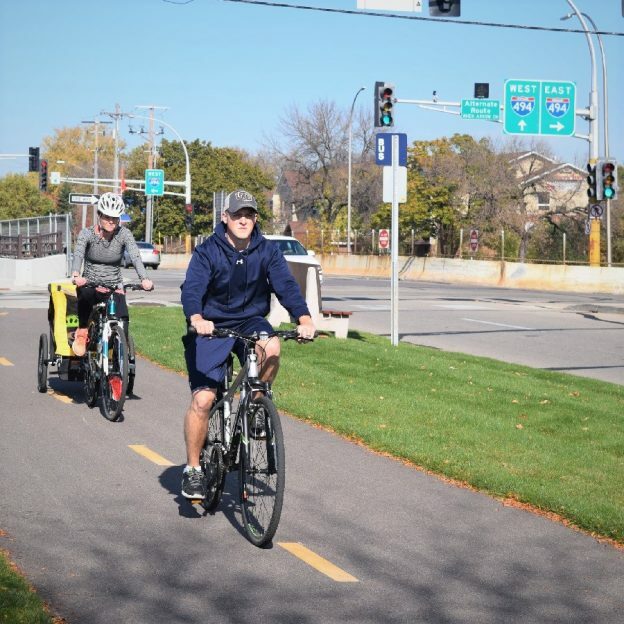 From the north parking lot, at the Mall of America, the sidewalk/trail running parallel with American Boulevard make the best bike commuter route along the 494 freeway strip. Once at the Mall you will find bike racks near most of the main entrances and lockers for changing cloths inside. If you are coming in by bus or light rail, use the lower parking ramp on the east side. There are bike racks next to the bus station to secure your bike. For more information see MOA services and map. Now riding east from the Mall, cross the 34th Avenue at the light rail station. Here at the southeast corner of this intersection you will see the Crown Plaza Hotel where the Northwest Airline Museum is located. One of the displays at the Northwest Airline Museum. 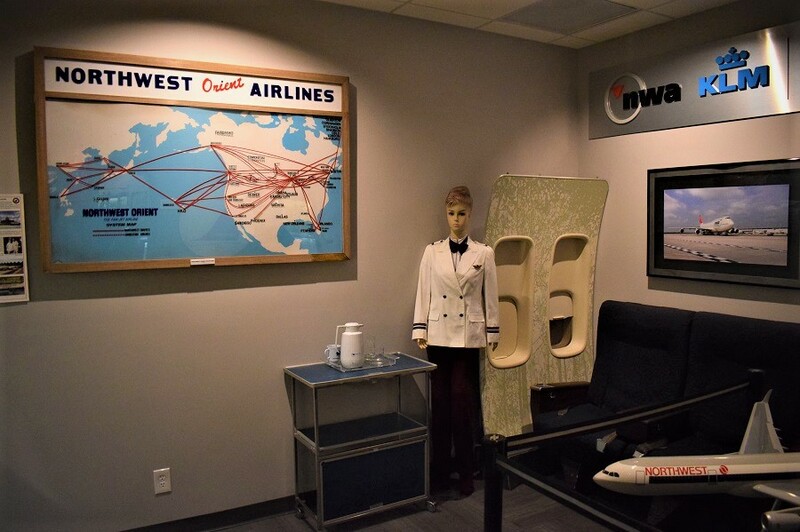 The Northwest Airlines History Center Museum, a mile east of the Mall of America is worth checking out if you are interested in aviation history. Here you will find a treasure trove of Minnesota’s home-town airline history on display. Visiting, you will find over 4,000 aviation artifacts, from 1926 to 1998, to sift through. Plus, a gallery of museum photos hanging in the hotels hallways to enjoy as you make your way to the exhibit. It is easy to spend a couple hours or more looking at the various collections here. The Minnesota Valley National Wildlife Refuge and Visitors Center over looking river and wetlands below . Across from the Hilton Hotel, is the Minnesota Valley National Wildlife Refuge and Visitors Center. Its grand stature overlooking the river valley below offers a castle-like presence. Inside, it feels bigger than the average visitors center and it is. It has everything including information on the wildlife that calls the refuge home. In the theater and interactive exhibits kids can learn about the wonders of the natural world. There are also several large murals that are made out tiny pictures of animals that can be found in the refuge. Step outside, right behind the center you will find a stone observation deck with two telescopes. Here it’s easy to focus on the flora and fauna across the river valley. It adds to the center’s castle-like vibe and enjoyment. Back on the route, cross the Minnesota river to watch a viking scrimmage game. 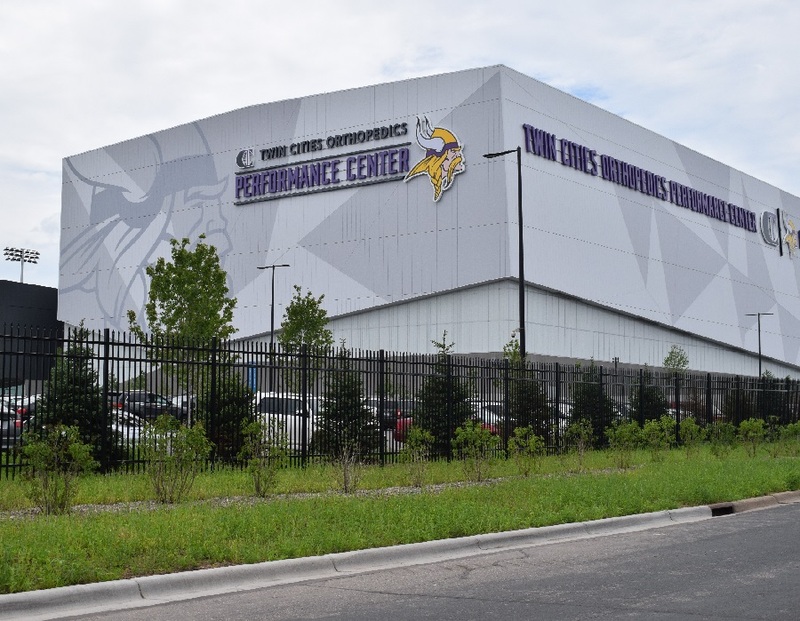 The team’s new headquarters, Twin Cities Orthopedics Performance Center will open next month for scrimmages, July 25th through August 16th. Each day of practice games at the new facility the gate will open to 5,000 fans, via free tickets. Daily, 1,300 of those tickets will be held for the general public. Season ticket holders will have first option to the remainder. If you have any questions about using the Vikings Mobile Ticketing App, contact the Vikings Ticket Office at (612) 338-4537. Other travel treasure opportunities to consider riding your bike to and from the Mall of America include: Stopping at the observation area at the Minneapolis/St. 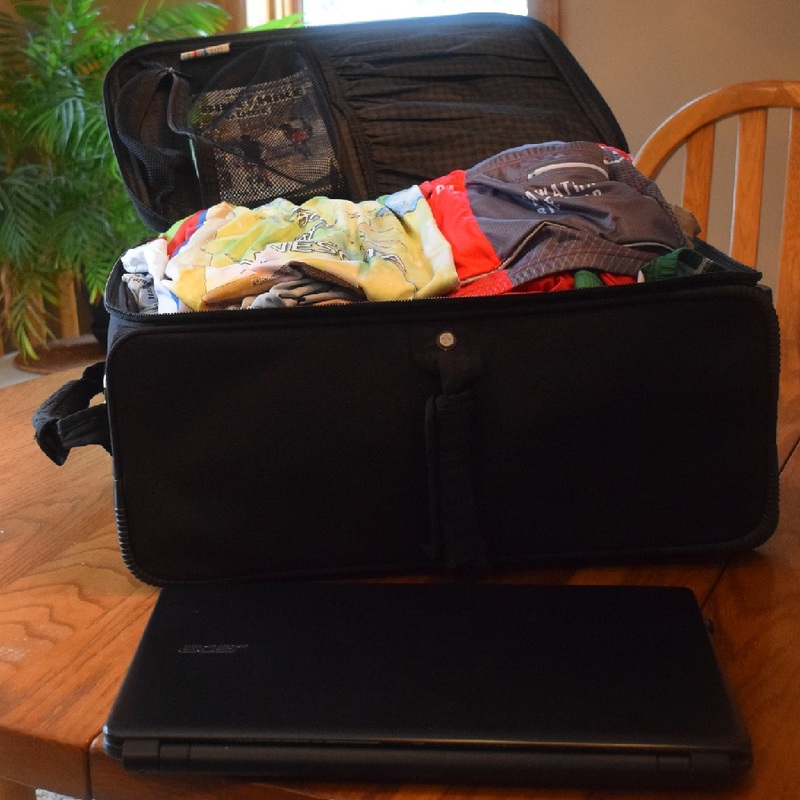 Paul International Airport; taking the trail to Lake Nakomis, then Minnehaha Falls and back through Fort Snelling State Park; and a family outing at the Works Museum. The MSP Airline Observation Area for those wishing to watch the big planes land and take off. For more fun when staying or visiting Bloomington check out all the activities, attractions and lodging accommodations here. 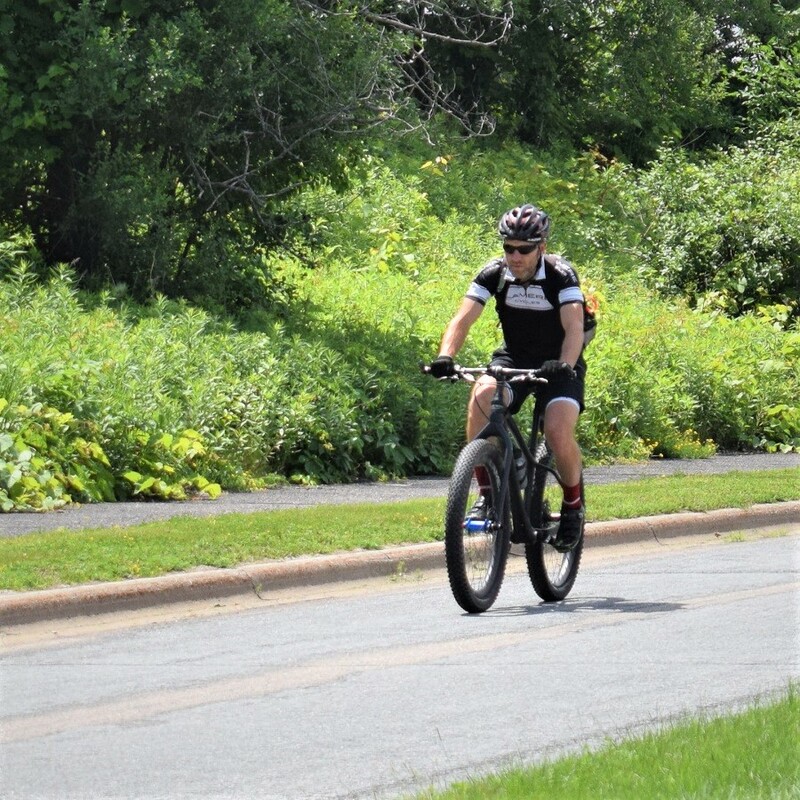 This entry was posted in Destinations, News and tagged #moa, Blooming bike map, Bloomington attractions, Bloomington MN, Mall of America, Minnesota Valley National Wildlife Refuge and Visitors Center, MSP airport viewing station, multi modal commuting, Northwest Airline Museum, the Works Museum, Twin Cities Orthopedics Performance Center, Vikings Training Camp on June 25, 2018 by Russ Lowthian.